A Muslim Brotherhood-affiliated activist whose organization recently came under fire for holding an anti-Semitic rally in support of ousted Egyptian President Mohammed Morsi will head a fundraiser for Democratic Rep. Gerry Connolly (Va.). U.S.-based Muslim Brotherhood allies Akram Elzend and Sameh Elhennawy will co-host a fundraiser for Connolly later this month at the Fairfax residence of Mohamed Mohamed, according to a copy of the invitation obtained by the Washington Free Beacon. Attendees of the March 22 fundraiser are asked to donate between $150 and $400 in order to attend the event, where supporters will have a chance to "express appreciation and have direct conversation with" Connolly, according to the invitation. A form attached to the invitation asks donors to include their personal information and contains a message that the materials were "paid for and authorized by Connolly for Congress." The event has attracted the attention of some U.S.-based analysts who track the Muslim Brotherhood, particularly due to a pro-Morsi rally several weeks ago in New York City that featured anti-Semitic displays and was organized by a group Elzend cofounded. Both Elzend and Elhennawy have been tied to Egypt’s Muslim Brotherhood and were listed as U.S.-based cells of the group, according to a report in Egypt’s El Watan newspaper. They also were identified on a list of Morsi supporters in America who issued an Arabic statement demanding that the former president "cleanse the media and police." The statement additionally hailed Morsi’s power grab in Egypt as "one of his revolutionary decisions." Elzend is a co-founder and chair of the pro-Morsi group Egyptian Americans for Democracy and Human Rights (EADHR), which held a rally last month outside of the Saudi Arabian consulate in New York. Demonstrators at the rally were caught accusing the Saudis of trying to "sell Egypt to the Jews" and of being "dirtier than Jews," according to video of the event published by the Investigative Project on Terrorism (IPT). While Elzend’s EADHR later attempted to distance itself from the rally following negative press coverage, the group neglected to scrub several tweets organizing and promoting the rally, which was just one in a series of EADHR-sponsored pro-Morsi events. The EADHR also helped organize a pro-Morsi demonstration last year along the Thanksgiving Day Parade route in New York City. Many of the attendees were vocal supporters of the Egyptian Muslim Brotherhood’s Freedom and Justice Party. Additionally, EADHR leader Hany Saqr has been quoted in the Arabic press recently as a senior Muslim Brotherhood leader in the United States. Elzend’s EADHR also has organized pro-Morsi briefings on Capitol Hill that have featured individuals tied to the Muslim Brotherhood and even Sami Al-Arian, a convicted terrorist who worked with Palestinian Islamic Jihad (PIJ). Elzend additionally serves as an official with Muslim American Society’s (MAS) D.C. branch. The MAS was created in part by the former head of Egypt’s Muslim Brotherhood and is sympathetic to the group. Asked why he is co-hosting the Connolly fundraiser, Elzend immediately said that it has "nothing to do with the organization" he works for. Elzend added that Connolly is "a great man, he’s a great congressman, who really abides our values, American values, and principles, and he stands up for them." A fundraiser is "the least you can do for a good man," Elzend said. When asked about his reported ties to the Muslim Brotherhood, Elzend bristled. "I don’t want to answer that question," he responded when asked if he is a supporter of the Muslim Brotherhood and has worked with it. Pressed on the issue, Elzend declined to elaborate, saying "I’m busy, I’m driving." Asked once again if he supports the Muslim Brotherhood, Elzend responded, "I don’t want to answer your questions." 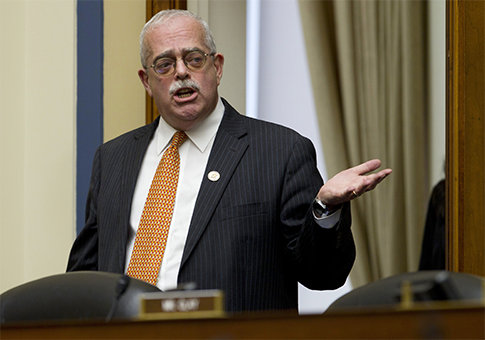 "This is an example of a patriotic American congressman who cares about our country who cares about our interests and our goals, short-term and long-term goals, and I’m encouraging other officials to really talk to Gerry Connolly and see where he’s really coming from, and see why he’s taken such a stance," Elzend said. "I’m not prepared to talk about anything else in my life," he added. Connolly, meanwhile, has personally expressed outrage over the ouster of Morsi and criticized the United States for not doing enough to back the ousted leader following his expulsion from office following last year’s democratic rallies in Egypt. "In my view it is not okay for the United States of America to say it’s okay to overthrow a democratically elected government, however fledgling and however much we disagree with them," Connolly said during a congressional hearing on the coup. "And it’s a sad day for me to sit here and see my government make such statements." Connolly campaign staffer Donald Brownlee, who is listed as the contact for the fundraiser, did not respond to a Free Beacon request for comment on the event. This entry was posted in National Security and tagged Egypt, Gerry Connolly, Mohamed Morsi, Muslim Brotherhood. Bookmark the permalink.